Big Win For Bucky ~ The Bucky Channel - The World of Sports from Wisconsin's Perspective. "We must protect this house!" That is one thing the Badgers under Bo Ryan have always done. It was even more important to protect home court tonight after the bad loss at Penn State. 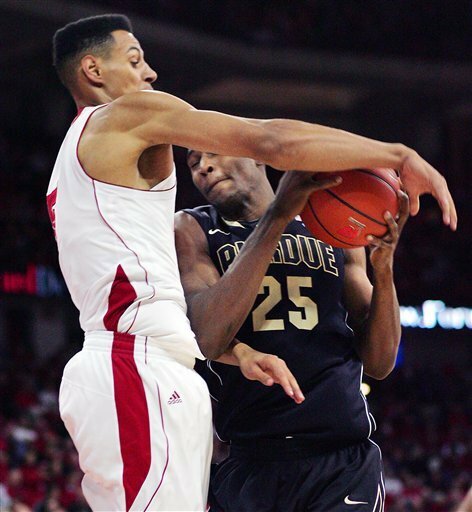 The Badgers stayed perfect at home this season with a 66-59 over #10 Purdue, but it was not an easy one by any means. It was an up and down, back and forth game, especially in the second half. After going into halftime with a 27-19 lead, Purdue came out on fire in the second half making their first nine shots and 11 of their first 12 to take a 46-39 lead. I think this is the quickest I've ever seen a time score against a Bo Ryan Badgers defense. But Wisconsin got it back together through Jordan Taylor, Jon Leuer, and 2 big 3's by Keaton Nankivil, taking a 6 point lead with 3:00 minutes left. Then, the dreaded 2011 Wisconsin Badgers collapse. Again, they just cannot get into their offense and wait to the last 5 seconds of the shot clock for Taylor drive and force a shot or pass to someone else to jack a 3, very frustrating. Tonight's late collapse led to a 7-0 Purdue run and a 1 point Purdue lead with 1:10 left. But tonight, the story has a happy ending for Wisconsin. Purdue would not score again. Wisconsin would take the lead through the unlikely Ryan Evans and hold on with good D and free throw shooting. Whew. This was a tense one to watch. - Ryan Evans scores the huge go ahead basket, then makes the block on the next possession on the other end. He scored 10 on the night and played 19 minutes. He played a total of 19 minutes in the last 5 games combined. He scored a total of 8 points in the previous 10 games. - Josh Gasser - good all-around game, but most importantly was aggressive with some nice drives to the hoop, not missing a shot on the night. - Wquinton Smith, I'm guessing in his first mention at The Bucky Channel, got the boys going during one of their lulls with a nice little scuffle with Luke Jackson and took a huge charge in the 2nd half. He is also a product of the great Rufus King High School in Milwaukee along with Lance Kendricks and Tony Brown. One last note has to be the free throw shooting. Wisconsin leads the nation in free throw shooting percentage. I noticed in the 2nd half Purdue racked up 5 fouls in the first 5 minutes and Wisconsin was shooting the bonus with over 10 minutes left, and more importantly, made all their one-and-one free throws. That was huge during the comeback and then maintenance of the lead in the second half. On the night they made 13-16 and their first 9. I'm still not totally sold on this team, and I don't think Purdue is top 10 quality, but it was fun to take this win. Up next is Michigan State on Super Bowl Sunday. Let's keep protecting this house. Wquinton, not Nquinton. Obviously the first mention on the site cause it wasn't right. Thanks for the help, change was made. Pretty fantastic game. They were able to weather the unbelieveably hot second half start by the Boilers, force Purdue to make some bad fouls and salt the game away late.